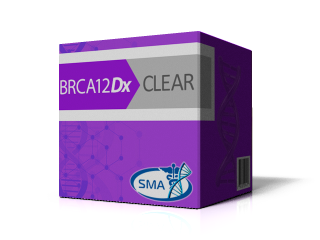 BrcaDx ClearTM is a next-generation sequencing assay designed for BRCA1/2 mutation testing for individuals who have a personal and/or family history of a hereditary breast and ovarian cancers. Hereditary breast cancer is most commonly caused by inherited mutations in BRCA1 and BRCA2 genes. Breast cancer is unfortunately quite common among American women, with about 1 in 8 (13%) women developing breast cancer at some point in their lifetime. More than 200,000 cases of breast cancer are diagnosed each year in the United States, affecting mostly women after age 50. Men can also develop breast cancer although such cases are rare; about 2,000 cases are diagnosed each year in the U.S.. Although most breast cancer occurs by chance however about 10% is inherited. BRCA mutations occur in about 1 in 400-500 in the general population. BRCA1/2 mutations are found more frequently in certain ethnic groups, including Ashkenazi (Eastern European) Jewish and French Canadian background. The Ashkenazi Jewish population has a high risk for having BRCA1/2 mutations with a frequency of 1 in 40. It is important to be aware that hereditary breast or ovarian cancer can be inherited from either the maternal (mother's) or paternal (father's) side of the family. All women have some risk of developing breast or ovarian cancer at some point in their lives. Having a BRCA1 or a BRCA2 mutation increases this risk. Women carrying a BRCA1/2 mutation also have an increased risk of pancreatic cancer, while men who have a BRCA1/2 mutation have an increased risk of breast, prostate and pancreatic cancer (Table 1). BrcaDx ClearTM is a next-generation sequencing assay designed for BRCA1/2 mutation testing for individuals who have a personal and/or family history of a hereditary breast and ovarian cancers. Testing includes sequencing, deletion and duplication analysis of the BRCA1 and BRCA2 genes. We use next-generation sequencing (NGS) technology to identify variants in the coding regions of BRCA1 and BRCA2 genes. The identified variants are classified according to the guidelines for sequence variant interpretation of the American College of Medical Genetics and Genomics (ACMG). Variant classification categories include pathogenic, likely pathogenic, variant of unknown significance (VUS), likely benign, and benign with likely benign and benign variants excluded from the report.